Judith Merkle Riley, née Judith Astria Merkle. Please do not combine with Judith Riley. Born on January 14, 1942, Judith Astria Merkle grew up in Livermore, California. Her great-grandfather was a Swiss emigrant, who moved to the United States in 1860. Her uncle was the famous baseball player Fred Merkle. Her father, Theodore Charles Merkle was controller of Project Pluto; and her brother Ralph C. Merkle is technological professor at a computer science school. Judith held a Ph.D. from the University of California at Berkeley and taught in the Department of Government at Claremont McKenna College in Claremont, California. She wrote six historical novels, including three in a series featuring the character Margaret of Ashbury. 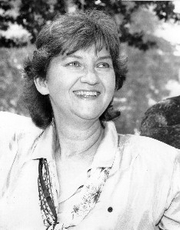 Judith Merkle Riley is currently considered a "single author." If one or more works are by a distinct, homonymous authors, go ahead and split the author. Judith Merkle Riley is composed of 7 names. You can examine and separate out names.